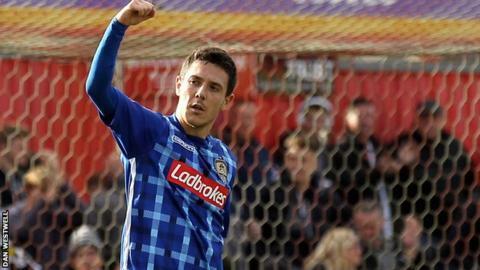 Notts County extended their unbeaten league run to three games with a hard fought draw against mid-table Exeter. Exeter took the lead when Tom Nichols cut inside and curled a measured finish into the bottom corner from 20 yards. Izale McLeod struck the post with a header for Notts County before Liam Noble finished past goalkeeper Bobby Olejnik from Jon Stead's knock down. Exeter's Jordan Tillson almost scored an own goal, while Arron Davies put the hosts' best chance wide. Match ends, Exeter City 1, Notts County 1. Second Half ends, Exeter City 1, Notts County 1. Graham Burke (Notts County) wins a free kick in the attacking half. Robert Olejnik (Exeter City) is shown the yellow card. Jamie McAllister (Exeter City) wins a free kick in the attacking half. Danny Butterfield (Exeter City) wins a free kick in the defensive half. Substitution, Notts County. James Spencer replaces Izale McLeod. Attempt missed. Liam Noble (Notts County) right footed shot from outside the box is close, but misses to the left. Attempt missed. Arron Davies (Exeter City) right footed shot from the centre of the box is close, but misses to the right. Substitution, Exeter City. Ryan Harley replaces Jordan Tillson. Delay in match Jamie McAllister (Exeter City) because of an injury. Substitution, Notts County. Graham Burke replaces Adam Campbell. Attempt saved. Jamie McAllister (Exeter City) left footed shot from outside the box is saved in the bottom right corner. Attempt missed. Adam Campbell (Notts County) right footed shot from the right side of the six yard box is close, but misses to the right. Jordan Tillson (Exeter City) is shown the yellow card for a bad foul. Foul by Adam Campbell (Notts County). Attempt saved. Tom Nichols (Exeter City) header from the centre of the box is saved in the centre of the goal. David Noble (Exeter City) wins a free kick in the defensive half. Substitution, Exeter City. Clinton Morrison replaces David Wheeler. Substitution, Exeter City. Arron Davies replaces Joel Grant. Attempt saved. Alan Sheehan (Notts County) header from the centre of the box is saved in the top centre of the goal. Corner, Notts County. Conceded by Danny Butterfield.